It was a very busy morning and we had such a lovely time. 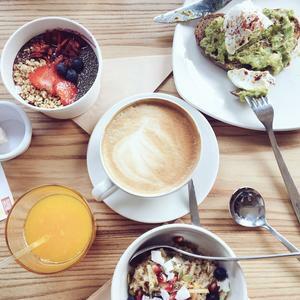 As a relatively new store in Liverpool, where the organic movement is in its youth, we wanted to partner with Wake Up To Organic to inform, educate and share our love of living organically to our customers. It connected us to our customers and local community. Getting to hear their views on organic food and a healthy lifestyle helped us learn the reasons why they bought organic and the reasons why they didn’t. As a new business, we wanted to know as much as we could about what our customers wanted, so that we could improve our offering and the way in which we marketed and promoted our store. What didn’t we do?! We wanted to ensure we covered all bases in the promotion so split our audience into two groups. 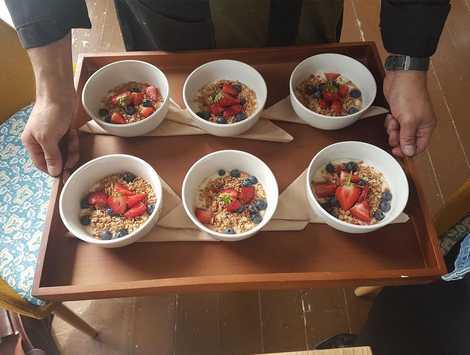 We decided that we would host a networking breakfast, offering a choice of organic breakfast items from the menu, made by our Head Chef who happened to be on his first day at work (talk about throwing him in at the deep-end) By inviting local press and bloggers, we spread the word out online. By inviting neighbours and local business people, we hoped the news would spread through word-of-mouth. We also ventured outside the store, it was a beautiful day, so we had tables outside with freebies of organic coffees, smoothies and treats. We also had Tilly from Wake Up To Organic join us, so it was great to see her interacting with the customers and passers-by, getting to promote the initiative and discuss benefits of organic. Yes, it certainly was! It was a very busy morning and we had such a lovely time. We invited our fellow independent business owners, local Business Development Managers and some bloggers to our networking event. It’s a great feeling when you can help people connect and may potentially help their business in some way. So, I would have to say that the highlight was getting everyone together in the one room and enjoying the delicious organic treats, of course! A lot of social media, as well as the stalls outside the store to attract attention on the day. 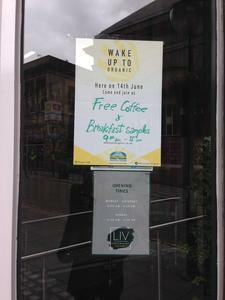 We contacted the brands partnered with Wake Up To Organic and received some samples and freebies that we gave to customers passing by. Do you have any great ideas for Wake Up To Organic 2018? We do have lots of exciting ideas, however, we like to surprise people and so we’ll be keeping tight-lipped about our plans until closer to the time. We’ll be announcing more on our social media channels, so keep a look out on there!